You can use your Client Portal to send us service requests. To start click on the “Schedule” link at the top of the page. Click the “Request New Service” button. Single Request allows you to quickly and easily request one visit at a time. Multiple Visits is a convenient way to request multiple visits that take place in a relatively close date range. For example its perfect for requesting two services a day from March 13th - March 19th. 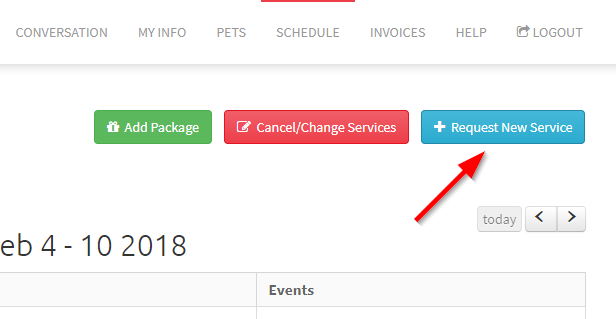 Fill out the Date, Time, Service, Pets and Notes sections. When ready click the “Add Request” button to send your request to us directly. Services are pending until reviewed and approved by us. We will send you an email confirmation when they have been reviewed and approved. If you have made a mistake or want to remove a request, you can do so by clicking the “Deleted Requested Service” link. Selecting " Multiple Requests" will result in a different screen that allows you to quickly request multiple visits at once. Start by selecting the date range that you want to request services. Select the primary service, the pets, and leave any notes. Finally select the times you want us on each day. 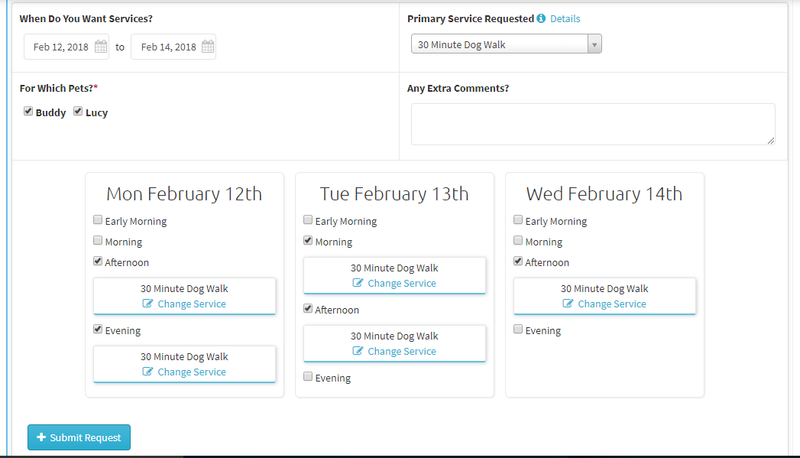 If you need to schedule another type of service besides the primary service, select the time you want, and then click on the "Change Service" option. When ready, click the “Request Services” button to send us your request. Services are pending until reviewed and approved by us. We will send you an email confirmation when they have been reviewed and approved.